In afraid of the oil mist which may do harm to the body, I bought a induction cooker home, trying to change my cooking style, making it healthy. But after a few monthes trying, I totally failed, I returned to the traditional way of cooking and leaving the induction cooker only to boil water now. The induction cooker is coming into China from the west, I suppose it may more fit the wester kitchen style, which basically not required any frying or fir control techniques. Talking about cooking techniques, the Chinese people are the number one. We cared about the fire control, which may do a great deal effort to a recipes's flavor and taste. 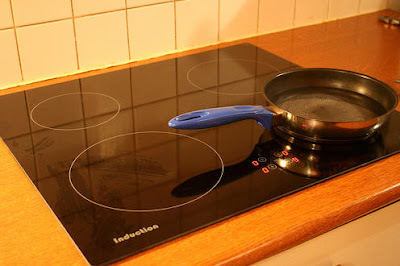 The induction cooker is not so flexible as the heat control, it's more mechanical and computer controlled, so less humanlized to give us free control. That's the biggest bug for a great Chinese Cooker. And then, another problem lies with the pan it used, it's all flat under the bottom. Acturally, we requried the more sharp bottom, not the flat ones, flat is only great for fring the egg, otherwise, it's no use. If you can use the induction cooker very well to cook as good Chinese dish as using the traditional way, don't hesitate to contact me. Most household units have at least 2.4 kW elements, and many have 3.6 kW; that is very conservatively equivalent, for gas cooking, to 17,000 BTU up to just almost 26,000 BTU. Flat is only great for fring the egg, otherwise, it's no use. Visit here.